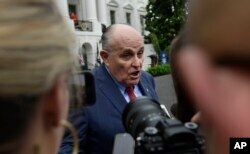 FILE - Special counsel Robert Mueller, who is leading the inquiry into possible coordination between Trump associates and Russia's efforts to sway the 2016 election, and President Donald Trump. America is waiting for special counsel Robert Mueller's report. But anyone looking for a grand narrative on President Donald Trump, Russian election interference and all the details uncovered over the past 22 months could end up disappointed. 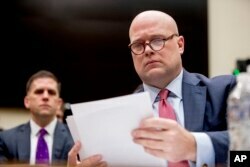 FILE - Then-acting Attorney General Matthew Whitaker appears before the House Judiciary Committee on Capitol Hill, Feb. 8, 2019, in Washington. 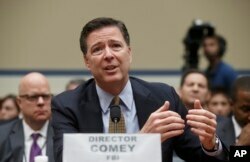 FILE - Then-FBI Director James Comey testifies on Capitol Hill in Washington, July 7, 2016, before the House Oversight Committee to explain his agency's recommendation to not prosecute Hillary Clinton. 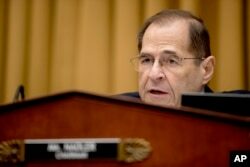 FILE - House Judiciary Committee Chairman Jerrold Nadler, D-N.Y., is seen during a committee hearing on Capitol Hill, in Washington, Feb. 8, 2019.